Ever since getting my Samsung Galaxy S4 mobile phone earlier this year I’ve been having a lot of fun getting to know my new device and I’ve especially been enjoying the apps and features it has to offer. At nearly the same time I got my new phone, I also started running on a more regular basis. 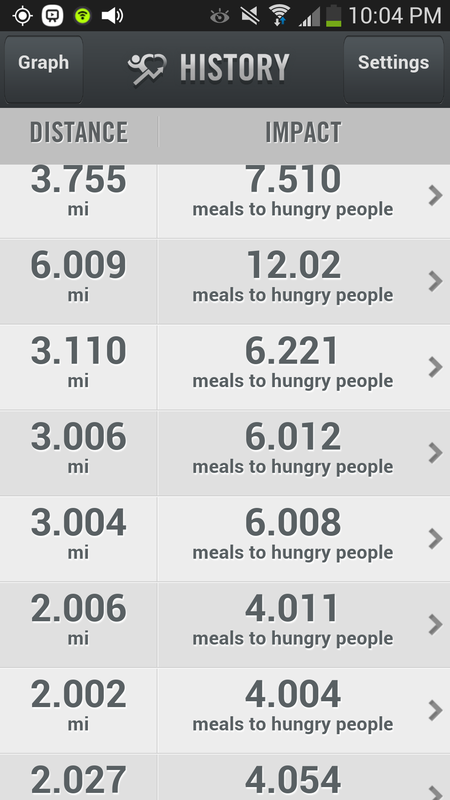 I heard about the Charity Miles app and knew I needed to download it right away. Not only was it a great way to track my time and distance while out for a walk or on a run, but it was just about the easiest way to make a charitable donation by simply doing an activity I was already going to be doing anyway. Choose your favorite charity (Mine is Feeding America) – you can choose the same one every time or a different one if you’d like to spread the love around. Select “Run”, “Walk” or “Bike”, press Start and start moving. Bikers earn 10¢ a mile and walkers and runners earn 25¢ a mile, which is then converted to “real world” impact for your charity. The Charity Miles app uses your phone’s GPS functionality to track your progress, distance and money earned for your charity. When you are finished with your workout, accept your sponsorship and spread the word by sharing your accomplishment on Facebook and Twitter. The app generates a report and emails it to you, but what I also love is that each workout is saved in the app itself. Here is a glimpse of my impact, which I’m quite proud of. I can’t tell you how good it feels to glance at my phone screen and visually see the impact I’m having on such a deserving charity. I highly encourage you to download the app and find a charity near and dear to your heart and start making a difference. I promise it will be the easiest way to “give” that will leave you feeling pretty darn good about yourself and a little healthier, too. Clearly there are several deserving charities to choose from, so what are you waiting for? Download the app and join me as we make a difference for these worthy causes and the lives of the people they support.